Until you’re a parent (or a sports fan), it might be hard to understand how you can love something with all of your heart while, at the exact same time, it drives you so crazy you want to run away and live in a log cabin. Kids have an infinite capacity for inspiring both your awe and your annoyance. 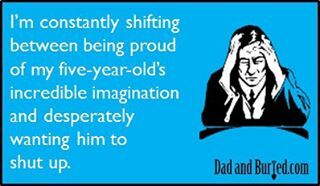 Based on my son’s recent behavior and burgeoning intellectual development, five-year-olds are right smack in the sweet spot. There’s a fine line between pride and prejudice, especially when it comes to your kids.